Your apartment in Berlin-Mahlsdorf with separate bedroom and living room. Affordable and comfortable with plenty of amenities and beautiful corner bath. Elegant double room in Berlin-Mahlsdorf for couples. Enjoy a relaxed weekend in Berlin, convenient and affordable for everyone. 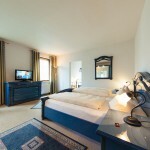 Our Hotel offers single rooms in Berlin-Mahlsdorf with versatile room facilities and breakfast at the in-house Café.